Collaborating since 1973, ShanZuo and DaHuang work together on their paintings, performances, sculptures, and prints, often communicating without words in a so-called dream dialogue. Renowned for their unique collaborative work process, the Zhou Brothers are considered one of the most accomplished contemporary Chinese artists in the world. Their thinking, aesthetic, and creativity are a symbiosis of Eastern and Western philosophy, art, and literature that informed their development since early childhood. Their indomitable spirit allowed them to leave behind their brilliant success in China, where they were hailed as national heroes for their early work, to step onto the world stage. In 1986, two young brothers, ShanZuo and DaHuang Zhou, visited Chicago to attend an exhibition of paintings they had created together in their home country of China. 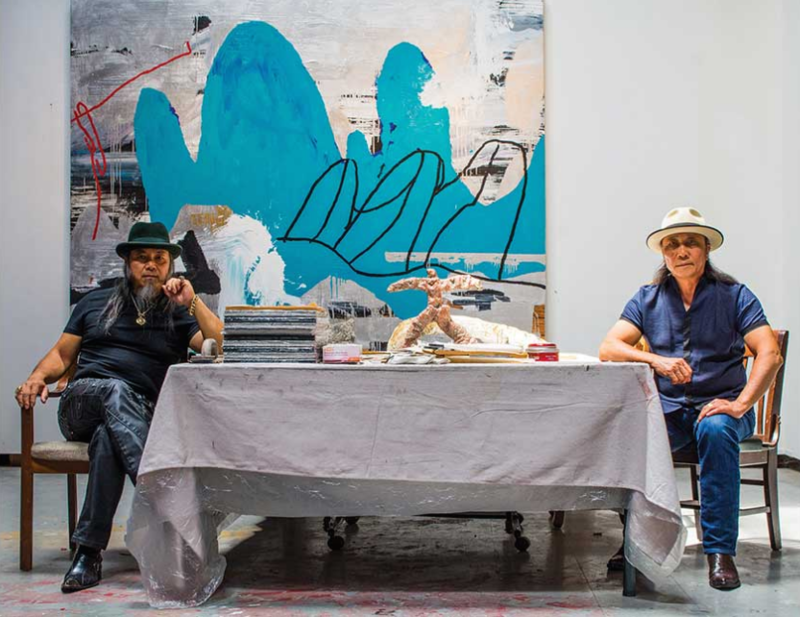 The brothers’ unique partnership—they collaborated on large canvases on which their sensibilities melded into a cohesive, though not always seamless, whole—had already made them rising art stars in Beijing. In Chicago, it was an even greater curiosity, in part because Americans think of visual artists as the ultimate individualists working in isolation, chasing intensely personal visions that no one else, not even a sibling, could possibly share. Two painters, one painting: How could that work? The brothers also loom large in realms beyond the art world, making paintings as a form of performance art in front of business and political leaders at gatherings such as the World Economic Forum in Switzerland in 2000. In 2011, President Obama commissioned the Zhou Brothers to create a painting that he presented to China’s president, Hu Jintao, in a private ceremony attended by the brothers at the White House. But even as the Zhou Brothers’ career has expanded into most corners of the globe, they have anchored themselves in Chicago, specifically in the South Side’s Bridgeport neighborhood. They live and work in a former Polish social club, which now contains a vast, airy, light-filled studio where they create their paintings, often working on up to 15 large pieces at once. (Sometimes the brothers paint with the stretched canvases lying flat on the floor, sometimes standing up, sometimes both at different stages.) And two blocks away, the Zhou B Art Center, a sprawling complex of galleries, artist studios and event spaces established by the brothers at 1029 W. 35th Street, is preparing to celebrate its tenth anniversary this fall. From the start, then, their collaboration was rooted at least as much in conflict as in harmony. When they paint, the brothers’ separate identities neither merge nor disappear; rather, they engage in a dialogue, one responding to the other, and sometimes the conversation can become a bit heated. The greatest mystery, perhaps, is that for all the struggle implicit in their creation, the paintings often arrive at a place of harmony, or at least a balance of elements, however precarious. Sometimes the balance has the feeling of competitors battling each other to a draw; other times, a natural order is achieved, like planets threatening to collide but slipping, at the last moment, into alignment. Their first collaborations in the 1970s were often representational and narrative-based, inspired by Chinese folklore—one early painting, currently on display in their dining room, shows a mythical beast being slain—and primitive cave drawings. In the ’80s, the brothers pushed their engagement with 5,000 years of Chinese art history into the realms of modern art, producing work that, while grounded in tradition, increasingly responded to the international art world in a way that combined the ancient and the cutting-edge. After settling in Chicago, the brothers spent the ’90s soaking up influences from their new environment, producing a body of work that was both heavier in texture and more abstract. In those paintings—several of which remain on view through Oct. 4 at the Zhou B Art Center as part of an exhibit called Zhou Brothers: American Period—minimalist figures (often secret self-portraits) are prominent, strolling through somber color fields illuminated by lightning flashes of vibrant red.